BERKELEY, CA – Researchers at the Department of Energy's Lawrence Berkeley National Laboratory have taken a giant step toward realizing the promise of laser wakefield acceleration, by guiding and controlling extremely intense laser beams over greater distances than ever before to produce high-quality, energetic electron beams. 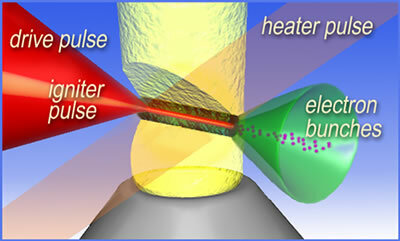 A plasma channel, denser toward the edges, guides the laser and allows it to form high-quality electron beams. As the laser pulse travels from left to right it excites a wake in the plasma, trapping and accelerating bunches of electrons to high energies (visualization by Cameron Geddes). For a quarter of a century physicists have been trying to push charged particles to high energies with devices called laser wakefield accelerators. In theory, particles accelerated by the electric fields of laser-driven waves of plasma could reach, in just a few score meters, the high energies attained by miles-long machines using conventional radio-frequency acceleration. Stanford's linear accelerator, for example, is two miles long and can accelerate electrons to 50 GeV (50 billion electron volts). Laser wakefield technology offers the possibility of a compact, high-energy accelerator for probing the subatomic world, for studying new materials and new technologies, and for medical applications. In plasmas, researchers have generated electric fields a thousand to ten thousand times greater than in conventional accelerators  but these large fields exist only over the short distance that a laser pulse remains intense; for tightly focused beams, that distance is typically only a few hundred micrometers (millionths of a meter). The resulting beams are of relatively poor quality, with particle energies so widespread that fewer than one percent have enough punch for scientific applications. The Berkeley Lab researchers achieve high-quality beams by first shaping a channel through hydrogen gas with powerful, precisely timed laser pulses, then accelerating bunches of electrons through the plasma inside the channel. Because of the controlled accelerator length and the characteristics of the channel, there are several billion electrons in each bunch within a few percent of the same high energy, more than 80 MeV (80 million electron volts). The work was done by the L'OASIS group (L'OASIS stands for Laser Optics and Accelerator Systems Integrated Studies), led by Wim Leemans of the Center for Beam Physics in Berkeley Lab's Accelerator and Fusion Research Division. To analyze their successful experiment, the group collaborated with the Tech-X Corporation of Boulder, Colorado, using the VORPAL plasma simulation code to model their results on supercomputers at DOE's National Energy Research Scientific Computing Center (NERSC). The researchers report their results in the 30 September 2004 issue of Nature. "Laser wakefield acceleration works on the principle that by sending a laser pulse through a gas to create a plasma  separating negatively charged electrons from positively charged ions in the gas  some of the free electrons will be carried along in the wake of the plasma wave created by the laser," Leemans explains. "Imagine that the plasma is the ocean, and the laser pulse is a ship moving through it. 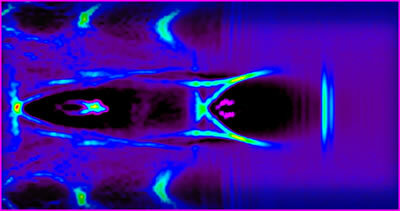 The electrons are surfers riding the wave created by the ship's wake." Unfortunately, simply punching a laser pulse through a plume of gas makes for a very short trip. "The acceleration distance is limited to what's called the Rayleigh length  the length over which the laser remains focused  which is determined by the wavelength of light and the size of the spot to which the beam is focused," says Leemans. "For optimum acceleration, you have to keep the wake going for many Rayleigh lengths, until just before the electrons start to get ahead of the wave and lose energy"  a distance otherwise known as the dephasing length. To achieve this extended acceleration length, Leemans, working with his graduate student Cameron Geddes and other colleagues, implemented what he refers to as "the plasma analogue of an optical fiber." The basic principle of this technique was developed a decade ago, using less powerful lasers, by Howard Milchberg from the University of Maryland, then improved upon by Leemans and his former student Pavel Volfbeyn in 1998. But it took nearly another six years before the L'OASIS lasers and instrumentation were sufficiently advanced to try guiding extremely intense laser pulses with the same method. One of the laser beams from the L'OASIS laser is first sent as an igniter pulse through the gas, to form what Leemans describes as a wire of plasma. A second, heater pulse enters from the side and heats the plasma wire; as the heated channel expands, it becomes denser at the edges and less dense at the center. Five hundred picoseconds later, time enough for the ions to move out of the way, an intense driver pulse, with peak power approaching 10 terawatts (10 trillion watts), plows through the plasma capillary. "There's a close analogy between the plasma channel and an actual optical fiber of the kind used to send data," Leemans says. "The simplest optical fibers are made with two kinds of glass. The glass in the center has a higher index of refraction  meaning that light moves through it more slowly  and the surrounding glass walls have a lower index of refraction. The effect of this is to make sure the wavefront of the light stays flat as it moves through the fiber, allowing the laser to remain focused in a small spot over a long distance." Leemans explains that the same is true of the plasma channel, in which the plasma is denser at the edges than in the center. "Plasma actually has a lower index of refraction than vacuum, so the wavefront moving through the center of the channel moves slower than at the edges. This flattens the otherwise spherical laser wavefront and extends the distance over which the laser stays intense enough to excite large plasma waves." By tailoring the plasma channel conditions and laser parameters, the researchers are first able to achieve clean guiding of laser beams of unprecedented high intensity, while suppressing electron capture. This paves the way for using laser-powered plasma channels as ultra-high-gradient accelerating structures. Next, by using even higher peak powers, plasma waves are excited that are capable of picking up background plasma electrons, rapidly accelerating them in the wake's electric field, then finally subsiding just as the surfing electrons reach the dephasing length, when they are on the verge of outrunning the wake. How is it that the electrons in the bunch are accelerated to nearly the same energy? Following the experiments, Geddes and the other Berkeley Lab researchers, with the help of their Tech-X collaborators, modeled the evolution of the high-quality electron bunches on supercomputers at NERSC. They found that the formation of large bunches of electrons with nearly the same high energy is due to several factors. Most critical is matching the long acceleration path to the dephasing length. Other factors include plasma density and laser power, and how the laser pulse evolved during its propagation in the plasma channel. 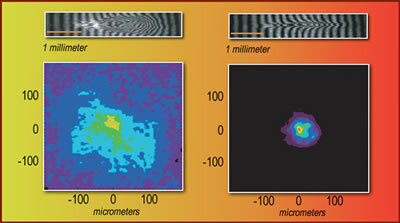 Without a preformed channel (left) the drive laser pulse blows out after a few hundred micrometers, producing diffuse bunches of electrons with wide energy spread. A preformed channel through the plasma (right) confines the drive beam and produces bunches of electrons with nearly uniform high energy. "The plasma-channel technique is an essential step toward developing compact laser wakefield accelerators with multiple stages, which can produce focused, ultrafast, high-energy bunches of electrons to compete with state-of-the-art machines using conventional radio-frequency acceleration," says Leemans. "But the new technique has already suggested novel sources of radiation, such as the efficient generation of femtosecond x-rays"  x-ray pulses measured in quadrillionths of a second  "and coherent terahertz and infrared radiation." 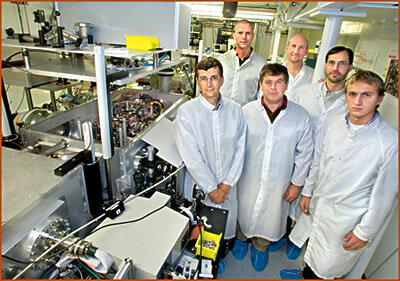 "High-quality electron beams from a laser wakefield accelerator using plasma-channel guiding," by Cameron Geddes, Csaba Toth, Jeroen van Tilborg, Eric Esarey, Carl Schroeder, David Bruhwiler, Chet Nieter, John Cary, and Wim Leemans, appears in the 30 September 2004 issue of Nature. Berkeley Lab is a U.S. Department of Energy national laboratory located in Berkeley, California. It conducts unclassified scientific research and is managed by the University of California. Visit our website at http://www.lbl.gov.